So, I read Jane Eyre, first published in 1847, before I ever read Daphne DuMaurier's Rebecca (1938) or Mary Stewart's Nine Coaches Waiting (1958). Do you know those two books? Both of them are obviously influenced by Charlotte Brontë's novel; I'd go so far as to call the Stewart book an homage; and it's hard to read either without thinking of Jane. I loved and read and re-read all three of them; and eventually the day came when I couldn't read Jane Eyre without thinking of Rebecca and Nine Coaches Waiting. My appreciation of the novel that was written first began to be influenced by later novels Charlotte Brontë never could have read. I love that time-travel aspect of intertextuality. Here's another example: Now, when I read Hamlet (c. 1603), I enjoy it even more than I used to, because I'm bringing Tom Stoppard's play Rosencrantz and Guildenstern Are Dead (1964-65) along with me. And I can't think of those two plays together without considering the role they play in the book Tam Lin (1991) by Pamela Dean -- which is, itself, a retelling of an old tale. Ah! I just love how everything leans on everything else! Everything's all mixed together in a marvelous mess! What's the word for this when it happens with music? My musical understanding is unsophisticated, but that doesn't mean that I haven't noticed that John Williams, for example, has done a job on me. I grew up listening to Dvorak's New World Symphony (1893). Then, one day, I noticed that I couldn't listen to it anymore without thinking of light saber duels and/or sharks. Does this happen to you? Well, if it doesn't, it might be about to, once I explain. :o) First, go listen to the 3rd movement of the New World Symphony here. The theme I'm going to point out happens repeatedly throughout the movement, but just to make it as clear as possible for those not familiar with the symphony, pay especially close attention when the clock hits 2:32. Listen to the bit from 2:32 to about 2:41; listen to it a couple of times. Then, go here to watch Darth Maul fighting Obi-Wan and Qui-Gon. Turn the sound up. Listen to the little snippet that starts at 0:13, continues through to 0:23, and then repeats at various moments throughout the entire fight. Hear it? Then there's the first 15 or so seconds of the 4th movement of the New World Symphony, here, which sound famously like the theme of Jaws, here. I don't know if there's a generic term for composer's using stylistic or thematic material from other composers, other than words like borrowing or stealing, which are really more judgmental than is appropriate. John Williams is famous for this. Other examples include the influences of Holst's The Planets on Star Wars, particularly in the orchestrations (which instruments are playing), and the music associated with the Ark in Raiders of the Lost Ark, which is clearly related to Ravel's Mother Goose Suite. His more recent movies, like the Harry Potter series, sound to me more like he is borrowing from himself, rather than other composers. A more general example is that Williams is a master of associating particular musical themes with characters, objects, or places in his movie scores, which is a technique that was first developed by Wagner in his operas. In the realm of more explicit quotes, composers routinely write sets of variations based on themes by other composers. Obvious examples include Rachmaninoff's Rhapsody on a Theme of Paganini (that particular theme has been used by many composers, including Andrew Lloyd Webber) and the Haydn Variations by Brahms. Another related term is the quodlibet, in which a composer mixes several folk or popular songs in one piece of music, with the expectation that the audience will recognize and appreciate the songs being combined. I could go on about this all day, so perhaps I should stop now. Actually I have one more thing I have to mention. If you are looking for a composer who deliberately refers to the music of other composers and demonstrates musical relationships between them, you should try Luciano Berio. Like mrmorse said, John Williams is a "master of associating particular musical themes with characters, objects, or places". That's called a leitmotif if I remember right (when a certain musical idea is associated with a person, place, or idea). I'm a huge Jane Eyre & Rebecca fan and I totally agree. The convoluted plot makes it all the more entertaining. I haven't heard of Nine Coaches Waiting. Thanks for recommending it. Btw, I finished Fire yesterday. It was beautiful. I enjoyed it immensely. My husband, and incredibly grounded and very realistic person (he's a computer consultant) says that there's not a lot of opportunity to produce something 'original' anymore. That we're just building off of what we already know. The only original part comes from what we bring to the work. His contribution to music is that he can sing two songs at the same time. Impossible? Not for him. He can sing "This Land is Your Land" and "God Bless America" simultaneously. I wish I had a music clip to convince you. But, it's got some words from both songs, laced with melodies from both songs. There are also classical pieces that were clearly borrowed for Beauty and the Beast and The Little Mermaid, but I can't remember now which ones. I only think of it when I get confused about what's playing! Sometimes when I am thinking of a song, something about it will remind me of another song, so I will go straight from one to another in my head, even in the middle of the song. In fact, there are some songs when I always go from one to another because there is a "trigger" note in the song. But I can't think of what they are now! +1 Dvorak: there's a bit in his eighth symphony that Phantom of the Opera echoes. I don't remember which Dvorak movement, offhand, but if you listen to it, the moment (chromatic runs down and back up) is unmistakable. Thanks to everyone giving me an education! Kate, I remember B&tB reminding me strongly of classical music I knew. I'm always fascinated by classical music or literature that shows up in pop culture...like how I read Turn of the Screw because I thought it would give me some insight into the many mysteries of Lost, which I used to watch religiously and now have given up on. My most recent discovery of this was late at night watching the Arts Showcase on Boston local access tv--they played a clip of a flautist performing a piece that was creepily familiar to me. I recognized it because a repeated run of notes in this flute piece (Syrinx by Debussy) is one of the signature flute runs used in an anime I adore from the 80's, Fushigi Yuugi. So I found videos of both on YouTube! The Debussy piece is here: http://www.youtube.com/watch?v=A_ZSSkMzS5E and the anime I knew it from is here: http://www.youtube.com/watch?v=gM18LgZ59J8. The flute part in the anime clip starts at 2:10. Weird, when I discover these things backwards! Hi Kristin, long-time lurker, first-time poster (and avid fan of Graceling to boot!). I am literally watching the Special Feature on the Extended Edition LOTR Two Towers DVD about the soundtrack RIGHT NOW. And how there are different themes for the different people and places, and how each theme was written and influenced. Rachel, I totally enjoyed the clips! Okay, here's the Disney Beauty and the Beast thing. Listen to the Prologue by Alan Menken here, then listen to "The Aquarium," from Carnival of the Animals by Saint-Saëns here. Not exactly subtle! Amanda, you're so right! I read The Eyre Affair; there should be a picture of it in the dictionary next to "intertextuality." I'm actually curious now to read on in the series. I liked TEA but didn't love it... but if the later books are even better.... btw, Jasper Fforde, imo, has the best name ever. The Well of Lost Plots is the 2nd book and Lost in a Good Book is the 3rd - this is my favourite. Something Rotten is the 4th and there are resolutions to twists you didn't even realise were there! Good stuff. I'm now reading his OTHER series which actually is a story within the Next series - does this make sense? Anyways, it's called The Big Over Easy and it involves the murder/suicide of Humpty Dumpty. It's pretty dang clever. Ah ha! I went digging around and came back to report on the Beauty & the Beast inspiration, but you beat me to it. Carnival of the Animals it is, and boy, that one is so clear! Now if only I could remember the one that The Little Mermaid reminds me of. WOW, I never realized the correlation between the prologue and Saint-Saëns was so clear. Pretty cool. Another Mary Stewart lover! As a teen Nine Coaches Waiting and others of her books made me secretly wish to become a writer. I think I read Jane Eyre later and definitely know I read Rebecca much later. Intertextuality concept encourages me when I realize I'm using something in a story where I know which book influenced me to do so. 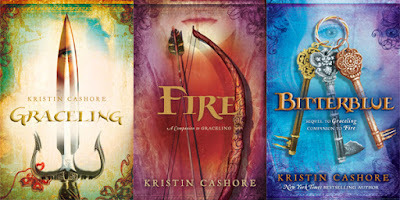 BTW, I'm putting a review of Graceling on my WIP website today.